File photo of Nigeria Customs Service office in Abuja. 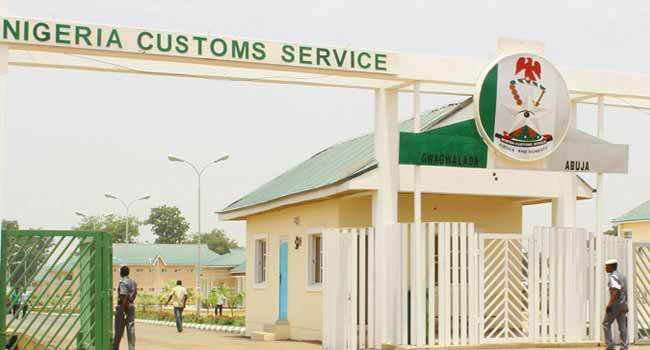 Four persons were feared killed, while six others sustained gunshot wounds following an alleged clash between men of the Nigeria Customs Service (NCS) and smugglers at a border town in Ogun State. The incident was said to have occurred at Ilara, in Imeko-Afon Local Government Area of the state at about 8:30 a.m. on Saturday. The clash occurred when suspected smugglers in a bid to move prohibited bags of rice in a convoy of vehicles to Abeokuta, the State capital, were accosted by a joint anti-smuggling patrol team made up of the operatives of the NCS and soldiers on the “OP MESA”. In a bid to confiscate the contraband goods the smugglers put up a stiff resistance during which guns were freely deployed to settle the score. Confirming the infraction, the Ogun State Area Command Public Relations Officer of the Customs Service, Abdullahi Maiwada said he could not ascertain if there was casualty as investigation is still ongoing.